The TechDex Direct2Client (Direct To Desktop) software is a breakthrough in direct messaging. This Desktop Autoresponder by-passes spam filters, and your messages appear on the receivers’ computer. This non-intrusive technology is currently being used by fortune 500 companies like Forbes, and has a 100% open rate, because your subscribers will always see their messages. Now you can achieve 100% message delivery rate, boost customer loyalty, skyrocket your message response rates, recover “lost” revenues & generate more sales from your messages and newsletter. This is the answer to falling email response rates, wasted email marketing efforts and ALL of your email nightmares, problems, weaknesses and shortcomings like: spam filters/blockers, blacklisting, bounce backs, CAN-SPAM Act, and more. Ever Heard of ‘False Positives’? A false positive occurs when legitimate, wanted email is incorrectly identified as spam. These are your legitimate,Â “wanted” , “requested” emails that are getting trashed BEFORE they reach your subscribers’ inboxes! With TechDex Direct2Client email marketing alternative, you can kissÂ all email publishing problems, weaknesses and shortcomings goodbye. TechDex Direct2Client Solves All Your Email Problems! No Spam filters/blockers for you to worry about! You see if you’re not using TechDex Direct2Client, you’d never know which emails are being filtered and which of your subscribers aren’t getting your messages, since they usually don’t bounce back, do they? In other words emails were filtered as junk/spam before anyone had a chance to read them. Would you like to send messages and newsletters to your subscribers without worrying about spam filters/blockers intercepting your mailouts? So WHY Direct To Desktop? TechDex Direct2Client Messages are Not Emails! NO email filters/blockers can intercept them or stop them from getting to your subscribers. Nothing stands between you and your subscribers. Finally! You Can Write All the ‘Forbidden’ Email Words! Use all the spam trigger words and phrases as many times as you like! Thanks to TechDex Direct2Client non-email technology and message delivery system, you can finally write all the ‘forbidden’ spam-trigger email words and phrases you like! Never Receive a Single Spam Complaint, Ever! TechDex Direct2Client is based on ‘pull’ technology. In other words, you don’t ‘push’ or ‘force’ your message to your prospects’/subscribers’ email boxes. They are the ones who CHOOSE to receive and ‘pull’ your message to their TechDex Direct2Client desktop reader. 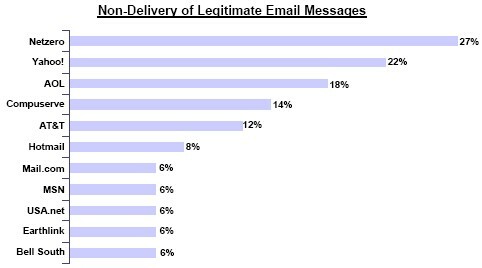 This guarantees that your legitimate messages and newsletters are never ever mistaken for spam. Your Message Will Never Disappear Under a Mountain of Spam Mail Again! Ever! Never Worry About Being Blacklisted! Only email publishers can be blacklisted. A TechDex Direct2Client publisher can never ever be blacklisted. Never Lose Subscribers Due to Email Address Changes. How Does TechDex Direct2Client System Work? Even though TechDex Direct2Client’s underlying technology is absolutely the latest, the system is very easy to use. Even a 12 year old can use it! 1. Publisher side/application: used by publishers. This is your side where you create and manage your messages, newsletters, subscriber lists, autoresponders and everything. 2. Client side/application: used by subscribers. This is the little application your prospects and subscribers download to their computers to be able to receive messages from you. In other words, they receive only your valuable content without the hassle of having to filter through a bunch of spam. Your custom branded Desktop Reader will only receive and display messages from YOU! TechDex Direct2Client client application is the most reliable way your subscribers can hear from you, providing a direct connection between you and them. Here’s How to Use TechDex Direct2Client: 1-2-3 Simple Steps! 1. 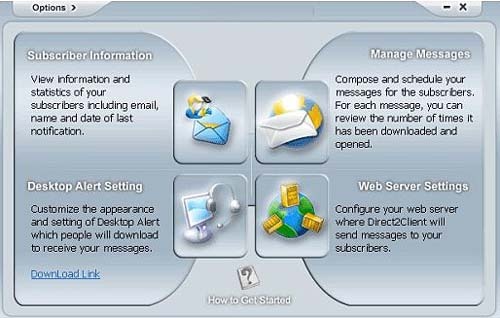 Create or import your messages to TechDex Direct2Client. 2. Select: Broadcasting, autoresponder scheduling or scheduling per calendar date. 3. Click “Save” or “Send”! Your subscribers download your fully customized TechDex Direct2Client Desktop Reader. Once they do, a small icon will sit in their taskbar trays (in the lower right hand corner of their screens), which automatically notifies them of any new messages they receive from you. Which is better, publishing via email, where your subscribers are getting your messages/newsletters along with 20 to 100 emails per day, or One-to-One Direct to Desktop Communication Channel! Desktop space is limited. It’s like real estate. The more it’s in demand, the higher its price will go. The price of your prospects real estate still has not skyrocketed! People are still willing to download your one-to-one direct communication channel because your prospects haven’t been flooded with requests yet. Most publishers are still totally unaware of Direct To Desktop technology. So, this is a time-sensitive opportunity! Grab it before it’s too late. Right now is your best chance to claim a permanent share of your prospects’ desktop real estate and secure yourÂ corner in their icon trays…Â before your competitors do. Once you do that, your prospects will be less inclined to uninstall your message reading application and icon to install your competitor’s! This is where you create/compose, edit, format, and send to your subscribers visually attractive, professional-looking HTML messages. Create multiple messages that contain color text, pictures, hyperlinks, and even dynamic components such as Flash animations and sound files. Use the built-in HTML editor to create your messages. Tip: Visually attractive text increases readability! Edit or delete created messages. 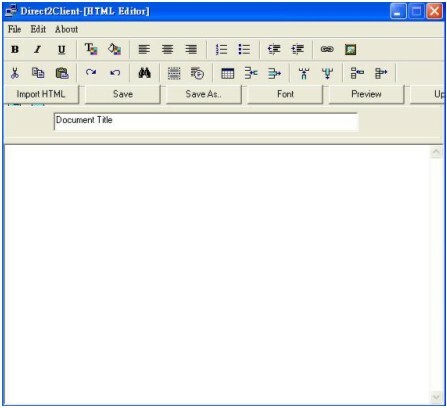 Import existing messages from HTML editing software or create your own from scratch. TechDex Direct2Client messages are delivered as a single, complete file. This means that contacts always see your full message with no broken links, or missing images even if they’re not connected to the internet. This is totally unlike e-mail messages, which must be “linked” to a web page in order to display separate documents such as images and Flash animations. Broadcast messages. No waiting for email autoresponder broadcast queues or anything!Â Your messages will appear right on the desktops of your subscribersÂ the moment you hit “send”! Your subscribers receive them immediately! (i) Standard autoresponder scheduling of messages (related to the first message). (ii) Schedule messages to be added and deleted at a future time and date. (iii) Set a notification date and an expiration date for each message. Message Notification/Expiration Options: Calendar and After-n-Day mode. Message tracking, see “next section”. View theÂ number of contacts who have downloaded/received. View theÂ number of contacts who have opened each message. View contact information and find out which messages your contacts are receiving and which ones they are reading. How many times each message has been downloaded. How many times a message has been opened. The date of the most recent notification received by each subscriber. Update, view and export (csv format) all the subscriber information. Upload your Desktop Alert application to your server for people to download it. Automatically post multiple messages on a web server, where they can be instantly downloaded by your contacts. Server requirement: At least 5MB – 10MB of space available. FTP access and CGI script capability. WE WILL PROVIDE WEB SPACE WITH FTP ACCESS IF YOU DON’T HAVE IT! This is the client-side application that your subscribers and customers download to their computer, enabling them to instantly receive your messages directly to their desktops. Desktop Alert can receive multiple messages from you. Messages can be broadcasted, scheduled in two ways: autoresponder series and by calendar date. 1. Select the frequency at which your contacts’ Desktop Alert will automatically check your server for new messages (daily, weekly, every two weeks, etc.). 2. Fully customize logo and graphics of the Desktop Alert. You can fully customize the appearance of the Desktop Alert with the company logo and graphics, or use one of a number of professionally designed templates. Note: TechDex Direct2Client Client Application is PC only, which of course is the majority of computer users worldwide. Even though the system is as easy to use asÂ ABC, you get multimedia tutorials to show exactly and step by step how to do everything. Note: the objective of this flash demo is to show the subscriber what they will get and what they need to do after downloading the Desktop Alert software. Download Your TechDex Direct2Client Client! There are a zillion ways you can have your prospects to use TechDex Direct2Client Client application. If you give your prospects something valuable FOR using TechDex Direct2Client, or THROUGH TechDex Direct2Client then you’ll have a mass exodus of people going from email to TechDex Direct2Client. Customers: If you are selling digital products, have your customers download the TechDex Direct2Client Client application to receive the links and instructions to download their product. Subscribers: Offer premium information, a quality newsletter, hot tips and special content via the TechDex Direct2Client client application. You must offer your TechDex Direct2Client clients something special… something that your website visitors and email subscribers won’t be getting. Offer freeÂ qualityÂ stuff that people would only be able to receive via TechDex Direct2Client client. In short, make your visitors and subscribers feel they’re getting a valuable upgrade. TechDex Direct2Client – Your Own Direct To Desktop Solution @ The Most CompetitiveÂ PriceÂ on the Web! Now you can own TechDex Direct2Client at the most competitive price on the entire web! 100% guaranteed! TechDex Direct2Client rivals its high-priced, feature-lacking competitors! 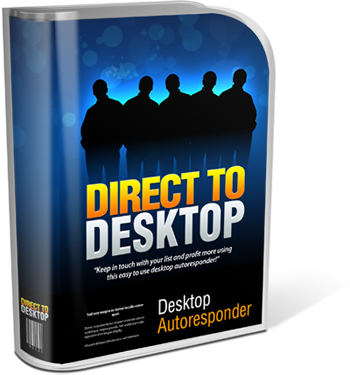 The closest product to TechDex Direct2Client that you can get is a $297 Direct To Desktop software that does not have the most important feature of all;Â autoresponder scheduling for your messages! TechDex Direct2Client software is now version 2, customer-recommended updates and changes, making it one of the very best desktop autoresponder software on the market, and a MAC port is soon to be released. You can purchase the TechDex Direct2Client right now for a limited special price of $197.00 ($100 off the regular price of version 1). Your TechDex Direct2Client is delivered digitally (i.e. via download), which means you can have it on your PC within the next 5 minutes!Â You will receive your download instructions immediately. But please be warned! TechDex Direct2Client price will be $495.00 as soon as the MAC port is available and we retire version 1. Please Act now! Free Lifetime Upgrades for Free! You Have Absolutely Nothing to Worry About with our 7-Day No-Risk, No Questions Asked, 100% Money-Back Guarantee! Your purchase is absolutely risk-free! Your 100% satisfaction is assured through our no risk, you-can’t-lose, no-hard-feelings,Â unconditional, no-questions-asked, iron-clad 7 days money-back guarantee! You have nothing… absolutely nothing to lose and everything to gain. If for any reason you’re not satisfied, just email us requesting a refund. Since the software is delivered digitally (i.e. via download), there’s nothing to ship back. Requesting a refund is hassle-free. With such a money-back guaranteeÂ it makes sense to give TechDex Direct2Client a try. Download TechDex Direct2Client now and don’t leave this breakthrough software solution for your competitors!